“If you think your doctors prescribe medications for you on the basis of their unbiased judgment and objective medical research, this book will disabuse you of that old-fashioned fantasy. 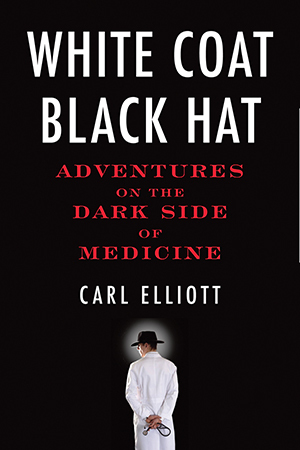 In his superb expos‚àöv†, Carl Elliott shows how the big drug companies have bribed and corrupted the medical establishment so that we no longer know which drugs are effective or why our doctors prescribe them.” —Marcia Angell, author of The Truth About the Drug Companies: How They Deceive Us and What to Do About It. On September 11, 2001, James Rockwell was camped out in a clinical-research unit on the eleventh floor of a Philadelphia hospital where he had enrolled as a subject in a high-paying drug study. As a rule, studies that involve invasive medical procedures are more lucrative--the more uncomfortable, the better the pay--and in this study, subjects had a fiber-optic tube inserted in their mouths and down their esophaguses so that researchers could examine their gastrointestinal tracts. On the morning of September 11, nearly a month into the five-week study, the subjects gathered around a television and watched the news of the terrorist attacks through a drug-induced haze. “We were all high on Versed after getting endoscopies,” Rockwell says. He and the other subjects began to wonder if they should go home. But a mass departure would have ruined the study. “The doctors were like No, no!’ “ Rockwell recalls. “No one’s going home, everything’s fine!’ “ Rockwell stayed until the end of the study and was paid seventy-five hundred dollars. He used the money to make a down payment on a house. Rockwell is a wiry thirty-year-old massage-therapy student with a pierced nose; he seems to bounce in his seat as he speaks, radiating enthusiasm. Over the years, he has enrolled in more than twenty studies for money, he estimates. The Philadelphia area offers plenty of opportunities for aspiring human subjects. It is home to four medical schools and is part of a drug-industry corridor that stretches from there into New Jersey. Bristol-Myers Squibb regularly sends a van to pick up volunteers at the Trenton train station. Most drug studies used to take place in medical schools and teaching hospitals. Pharmaceutical companies developed the drugs, but they contracted with academic physicians to carry out the clinical testing. According to the New England Journal of Medicine, as recently as 1991, 80 percent of industry-sponsored trials were conducted in academic health centers. Academic health centers had a lot to offer pharmaceutical companies: researchers who could design the trials, publications in reputable journals that could help market the products, and a pool of potential subjects on whom the drugs could be tested. But in the past decade or so, the pharmaceutical industry has been testing more drugs, the trials have grown more complex, and the financial pressure to bring drugs to market swiftly has intensified. Impatient with the slow pace of academic bureaucracies, pharmaceutical companies have moved trials to the private sector, which is where more than 70 percent of them were conducted in 2004. The result has been a broadening of the range of subjects who are used and an increase in the rates of pay they receive. “It was a human-subjects bazaar,” says Kenneth Goodman, a bioethicist at the University of Miami who visited the site. The motel was in a downtrodden neighborhood; according to later reports, paint was peeling from the walls, and there were seven or eight subjects in a room. Goodman says that the waiting area was filled with potential subjects, mainly African American and Hispanic; administrative staff members worked behind a window, like gas-station attendants, passing documents through a hole in the glass. Moreover, because IRBs scrutinize studies on paper only, they are seldom in a position to comment on conditions at a study site. Most of the standards that SFBC violated in Miami, for example, would not be evaluated in an ordinary off-site ethics review. IRBs ask questions like “Have the subjects been adequately informed of what the study involves” They do not generally ask if the sponsors are recruiting undocumented immigrants or if the study site poses a fire hazard. At some trial sites, guinea pigs are housed under conditions that would drive away anyone with better options. Guinea pigs told me about sites that skimp on meals and hot water or that require subjects to bring their own towels and blankets. A few sites have a reputation for recruiting subjects who are threatening or dangerous but who work cheap. Few people realize how little oversight the federal government provides for the protection of subjects in privately sponsored studies. The Office for Human Research Protections, in the Department of Health and Human Services, has jurisdiction only over research funded by the department. The FDA oversees drug safety, but, according to a 2007 HHS report, it conducts “more inspections that verify clinical trial data than inspections that focus on human-subject protections.” In 2005, FDA inspectors were finally given a code number for reporting “failure to protect the rights, safety, and welfare of subjects,” and an agency spokesman says that they planned to make more human-subject-safety inspections in the future, but as of early 2008 they had cited only one investigator for a violation. (A psychiatrist had held a research subject in his Oklahoma research facility against her will for four days after she tried to drop out of a drug trial. The psychiatrist had also been disciplined by the state licensing board for giving herpes to two of his patients.) In any case, the FDA inspects only about 1 percent of clinical trials. The guinea-pig pro has a delicate relationship with trial recruiters. Technically speaking, recruiters are supposed to frown on the practice of serial guinea-pigging. It is not clear what sort of data is generated by trials on people who have recently been taking many other drugs. Nor is it clear what toll these experimental drugs are taking on the long-term health of the guinea pigs themselves. For these reasons, most sites require that guinea pigs wait at least a month after one trial has ended before enrolling in another one. In practice, however, that requirement is sometimes handled with a wink and a nod. If a guinea pig behaves in a study, he may find himself recruited for a new one before he even leaves the trial site. Yet because their motivation for doing studies is purely financial, guinea pigs have a concrete incentive to lie about their medical history in order to qualify. “If you don’t lie then you’re talking yourself out of a job,” one guinea pig told me. Guinea pigs learn never to admit that they have been sick, that they have used illicit drugs, or that they have recently been in another study. However, once guinea pigs are accepted into a study, they are given financial incentives to stay in. Many sponsors penalize guinea pigs for missing follow-up appointments, and some back-load the pay scale so that guinea pigs have to stay in a study until the end in order to get most of their money. The only way for a subject to get out of a study without being penalized is to experience side effects so severe that the sponsors decide the guinea pig must be dropped. James Rockwell told me of a time when he enrolled in a thirty-day outpatient study of a drug for Alzheimer’s disease that required him to get dosed every morning before he went to work; he painted houses, which involved standing on high ladders. At one point during the study Rockwell decided to leave town to participate in a political demonstration. But this would have meant forfeiting part of his pay. “I decided to fake a story about fainting on the job,” he says, which meant he’d be dropped from the study but would still get paid. The Merck doctors tried to persuade him to drop out of the study voluntarily, but Rockwell stood his ground. When he was eventually dropped, it was with full compensation. Most guinea pigs rely on their wits--or on word of mouth from other subjects--to determine which studies are safe. Some avoid particular kinds of studies, such as trials for heart drugs or psychiatric drugs. Others have developed relationships with certain recruiters whom they trust to tell them which studies to avoid. In general, guinea pigs figure that sponsors have a financial incentive to keep them healthy. “The companies don’t give two shits about me or my personal well-being,” Nathaniel Miller says. “But it’s not in their interest for anything to go wrong.” That’s true, but companies also have an interest in things going well as cheaply as possible, and this can lead to hazardous trade-offs. The most notorious recent disaster for healthy volunteers took place in March 2006 at a testing site run by Parexel at Northwick Park Hospital, outside London; subjects were offered two thousand pounds to enroll in a Phase I trial of a monoclonal antibody, a prospective treatment for rheumatoid arthritis and multiple sclerosis. Six of the volunteers had to be rushed to a nearby intensive care unit after suffering life-threatening reactions--severe inflammation, organ failure. They were hospitalized for weeks, and one subject’s fingers and toes were amputated. All the subjects have reportedly been left with long-term disabilities. The Northwick Park episode was not an isolated incident. Traci Johnson, a previously healthy nineteen-year-old student, committed suicide in a safety study of Eli Lilly’s antidepressant Cymbalta in January of 2004. (Lilly denies that its product was to blame.) I spoke to an Iraqi living in Canada who began doing trials when he immigrated. He was living in a hostel and needed money to buy a car. A friend told him, “This thing is like fast cash.” When he enrolled in an immunosuppressant trial at a Montreal-based subsidiary of SFBC, he found himself in a bed next to a subject who was coughing up blood. Despite his complaints, he was not moved to a different bed for nine days. He and eight other subjects later tested positive for tuberculosis. In this lively narrative, Carl Elliott follows the plunge of health care into the abyss of consumer capitalism. Stories of drug production and research, drug marketing, and drug sales representatives combine with tales of bioethicists, professional guinea pigs, and "scientific" ghostwriters to illuminate the "dark side of medicine." Elliott's research and experience inform his eye-opening look into how money has infiltrated our health care system and deception has subverted our medical professionals. Drawing on his professional experience as well as extensive interviews with former and current industry professionals, Elliott explores the question of whether health care and consumerism can go hand-in-hand. After graduating from Davidson College, Carl Elliott earned his MD from the Medical University of South Carolina and his PhD in philosophy at Glasgow University in Scotland. He has held positions at a number of institutions in the U.S., Canada, New Zealand, and South Africa, including one at the University of Natal Medical School (now the Nelson R. Mandela School of Medicine), the first medical school in South Africa for non-white students and one at the Institute for Advanced Study in Princeton. He currently teaches at the University of Minnesota in the Center for Bioethics and the Departments of Pediatrics and Philosophy, while living in Minneapolis with his wife and three children. He has previously served as the author or editor of six books, including Better Than Well: American Medicine Meets the American Dream (W.W. Norton, 2003), and Prozac as a Way of Life (University of North Carolina Press, 2005). His articles have appeared in the New Yorker, The London Review of Books, Atlantic Monthly, The American Prospect and the New England Journal of Medicine. "Drug testing has always involved a kind of moral trade-off in which subjects are asked to takes risks for the good of other people" (p. 16). Do you think the decision to participate in a study is an altruistic one? What else could motivate participants besides money? What would motivate you to take the risks? In terms of research on human subjects, Elliott writes that "The dominant stream in bioethics sees the crucial issues as informed consent. Can the subject make a free and informed choice about whether to take part in a drug study?" (p. 146). What constitutes a "free and informed choice"? Does money skew that definition? What else could compromise it?
" (p. 102). Do you believe that doctors are not influenced by their ties? Do you think anything would change if they were no longer allowed to receive gifts? Would the information change? Would their decision-making process change? If not, what else could be done to solve the problem Healy is referring to? You are one of the chosen." (p. 77) Can you think of a position in your line of work that you associate in the same way? Have you ever or would you ever aspire to reach that position? Might there be any moral ramifications to the position? Would you still do it? In the 1990s, the development of "script-tracking" reports allowed drug reps to see exactly what drugs doctors were writing prescriptions for. Then reps could see the difference between the prescriptions doctors said they were writing, and the prescriptions they were actually writing. "Doctors might tell a rep that they were writing prescriptions for, say, Lipitor, when they weren't. They were just being polite, or saying whatever they thought would get the rep off their backs" (p. 61). Does it matter if doctors are being honest with reps or not? What could be the advantages and disadvantages of their dishonesty? On page 49, Elliott makes the comparison that "Like lobbyists, expert witnesses, or hit men, medical writers are instruments in a much larger enterprise. Their job is neither to support nor question the enterprise, but to play their small part as effectively as possible." What is he implying by these comparisons? How much moral responsibility should medical ghostwriters bear for their work? Is it unfair to expect them to bear any? On page 115, Elliott reveals that "Although some PSAs [Public Service Announcements] are sponsored by nonprofit groups, many are backed by corporations." Do you think this matters? Does it make the warnings on the PSAs any less valuable? On page 132, Elliott describes the efforts of two pharmaceutical companies, along with the Alzheimer's Association, in raising awareness of Alzheimer's disease. The companies' intention was to aid in the marketing of their drug Aricept, "a drug intended to slow the progression of Alzheimer's disease." Though the advocacy group and the companies seem to have different motives, do you think the motives or the results matter more? Should patient advocacy groups be wary of working with such companies or should they be grateful for the increased awareness regardless of the intentions? In discussing the effects of their industry ties on thought leaders, Elliott writes that "Most of the thought leaders investigated by Grassley have managed to retain their academic positions, even in the face of withering criticism" (p. 107). Should thought leaders be allowed to retain their academic positions? Why or why not? On page 156, Elliott lists a number of bioethics centers that are funded with pharmaceutical industry money. Later, he writes that "as bioethicists seek to become trusted advisers, rather than gadflies or watchdogs, it will not be surprising if they slowly come to resemble the people they are trusted to advise" (p. 170). Why do you think pharmaceutical companies would want to fund bioethics? Do you see this as a conflict of interest? What is compromised when bioethicists begin to advise the marketers? Stacy Carter describes how she was "so caught up in the moral crusade against cigarettes that she did not notice that the crusade was backed by a pharmaceutical company with its own commercial interests" (p. 116). Because the commercial interest coincided with the public/societal interest, does it cheapen the cause in some way? Do you think taking money from an organization indicates an endorsement of it? How would Carter's work have been different if the industry was not backing it? In a case like Prozac, when the drug causes an increased risk of suicide "on rare occasions," (p. 98) should the risk be made more public? Do you think it is likely that it will "frighten depressed patients from taking medication for their illness and increase the rate of suicide" (p. 101) as some doctors claim? Is it worth risking on either side? After one research subject died during a study, two bioethicists at the institution where he died wrote an opinion editorial in which "they lamented the fact that [the study's] death might slow the pace of medical research by leading to tighter regulation" (p. 152). Could these men have been PR agents protecting the reputation of their own employers? Does quick research or responsible bureaucracy save more lives? Are there other ways to keep the pharmaceutical companies honest and ethical? In the case of the "sting operation" against the institutional review board, Coast IRB, "it was Coast IRB that had been victimized, Dueber claimed. 'Innocent victims of this country cannot be lawfully defrauded by the government'" (p. 160). How do you feel about this argument? How far should the government be allowed to go? How else could the IRB have been exposed? "From the very start, drugmakers have tried to design marketing tools that resemble, as closely as possible, the vehicles that transmit empirical evidence: medical journals, scientific articles, abstracts, symposia, conferences, slide shows, and grand-rounds presentations" (p. 26). Do you think it is good for such marketing to be permitted, or should it be banned from these media? How should drugs be marketed, if at all? On page 62, Elliott explains that a "newer, regimented style of selling began to replace the improvisational, more personal style of the old-school reps. Whatever was left of an ethic of service gave way to ethic of salesmanship." What does he mean by "ethic of service" and "ethic of salesmanship"? Is an "ethic of service" better or worse than an "ethic of salesmanship"? How so? the masks and costumes suddenly drop off and the actors come face to face with one another as they really are" (p. 65). Do you think this is an accurate analogy? Would it be better if the masks were always off? What would that system look like, and how would it affect you? According to Elliott, "Patients are being replaced by health-care consumers" (p. 71) as the industry becomes more market-driven. Do you see yourself as a patient or a health-care consumer? How does this shape your perception about the health care you receive? Edward Bernays, who revolutionized the concept of Public Relations, "mastered the art of selling without the appearance of salesmanship. It was his gift to see how social conditions could be manipulated in order to increase sales in ways that were invisible to the customer" (p. 119). Do you ever feel like you are susceptible to this kind of manipulation? How do you think you could avoid being manipulated in this way? .For a handful of people, however, the discomfort with industry influence seems more visceral. Their necks prickle when they hear patients called 'customers' or a hospital unit referred to as a 'revenue generator.'" Do you fall into either of these categories? Which one? Can you expand on them? Do you think there are others? What is Elliott's purpose in writing this book? What does he hope to unveil? How does he expect us to respond? "Should journals publish industry-funded bioethics articles?" The Lancet, July 7, 2005. "Six Problems with Pharma-Funded Bioethics," Studies in the History and Philosophy of Biological and Biomedical Sciences 35, 2004. "Not-So-Public Relations: How the drug industry is branding itself with bioethics," Slate, December 15, 2003. Elliott C. Pharma Goes to the Laundry: Public Relations and the Business of Medical Education, The Hastings Center Report 2004, 34(5): 18-23. *Elliott C. Pappworth's Guinea Pigs, Biosocieties, (2008), 3: 147-149. *Elliott C, Abadie R. Exploiting a Research Underclass in Phase I Clinical Trials, New England Journal of Medicine 2008 (May 29); 358:22, 2316-17. Office of Inspector General, Department of Health and Human Services, "Recruiting Human Subjects: Pressures in Industry-Sponsored Clinical Research," Washington D.C., June 2000, 13. Simon, John, "Blockbusters to the Rescue." Fortune, January 31, 2006. Shamoo, Adil and Elizabeth Woeckner, "Research Ethics Boards: No Data on Quality of For-Profit or Non-Profit IRBs." PLoS Medicine 3, 2006. Horton, Richard. The Dawn of McScience. New York Review of Books 51(4): 7-9, 2004. When Experiments Travel: Clinical trials and the Global Search for Human Subjects, Adriana Petryna, Princeton University Press, 2009. Anatomy of an Epidemic, Magic Bullets, Psychiatric Drugs, and the Astonishing Rise of Mental Illness in America, Robert Whitaker, Crown, 2010.